Google Adsense is a free program that allows you to make money online with your websites. Google Adsense allows website publisher of all sizes to display relevant Google ads and at the same time, earn money. In other words, it is a contextual advertising program. Google ads can be displayed on web browsers at computer as well as mobile phone. Advertisements (or ads) from Google Adsense are always relevant to the content the websites where they are being displayed. For example if your website is about “learning golf”, Google Adsense will endeavor to display golf related advertisements on your website. With the targeted advertisement, it can provide your visitor the most relevant information and in return, you will get better earning. 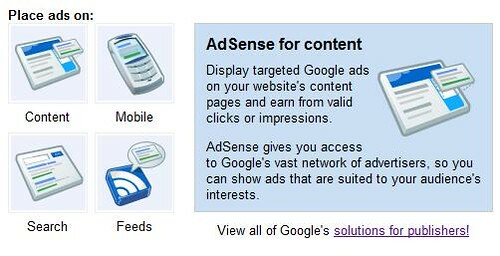 There are several ways to earn money from your content with Google Adsense. The simplest way is to earn money directly from you website content. What you need to do is to setup ads in your Google Adsense account, copy the generated code and paste the code into your websites HTML source code. You can further tracking your Adsense earning in detailed by adding channels to your generated ads. By putting Google Adsense for search in your website, you user can look for the most relevant information from your site or the Internet using the well-known Google search engine. Besides, it also suggest and display the relevant ads to your user and in other words to help you in maximizing your earning. Some of your website or blog subscribers may read your website’s update via feed. So may want to show them the relevant ads in your website’s feed. You can do so by integrating Google Adsense into your website’s feed. You can integrate your feed with Google Adsense by transferring your feed traffic to FeedBurner, a free tools provided by Google to further analyze your feed traffic. You may have some unused or unwanted domain in hand and still get some traffic. Don’t waste the traffic. You can use the Google Adsense for domain to display a list of relevant websites to you users. Your users get what they want and at the same time you earn some money. Sign up with Google Adsense is free and easy. Before you can sign up with Google Adsense, you will need to have at least a website that does not have pornographic content. If your website or blog is new, make sure you have enough content on your site before sign up the program. I suggest that you to have a least 10 content-full pages and update it regularly. If you have a website and never update for a few years, your application will unlikely to be approved. Do you have a website? Start monetizes your website with Google Adsense now!